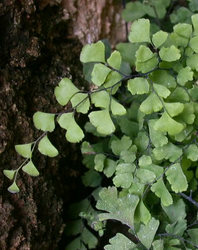 Common Name : Maidenhair Fern, Lady Fern. Part Used : Fronds, Leaves And Rhizomes. Habitat : Woodland garden; dappled shade; shady edge and cultivated beds. Uses : Maidenhair fern is antioxidant, astringent, liver bile stimulator, blood cleanser, cardiotonic decongestant, detoxifier, diaphoretic, diuretic, expectorant, depurative, antidandruff, vermifuge, hepatoprotective, hypocholesterolemic, hypoglycemic, hypotensive, stimulant and tonic. It is mainly useful in respiratory problems, hair loss, gallstones, liver problems, wounds, diabetes, skin problems, diarrhea, and dysentery. It is helpful to cure jaundice, convulsions and many chronic diseases. Leaves are edible and used in making tea and other refreshing drinks. Leaves are used as garnished material on foods. It breaks up stone in the bladder, spleen, and kidneys. Paste of leaves is useful in headaches and chest pains.